← Time ran out. I ran after. It’s been sixteen years since Stephanie Plum first hit the scene, and this not-so-effective, but cute and acerbic bail bonds-woman has not aged a bit. One for the Money came out in 1994… and Sizzling Sixteen is this year’s installment in the series penned by Janet Evanovich. Self-revelatory statement: It was the Stephanie Plum series that convinced me that I could write a funny mystery. They’re fun, they’re lightweight, people get killed but you don’t really care, Stephanie’s in danger but you know that she’ll either get herself out or get rescued by Joe Morelli or Ranger. They’re easy to read and (I thought) easy to write. And although I have succeeded in writing a funny mystery and am in the midst of another one in the series that is also getting yucks, it’s a lot harder than I thought it would be. In the meantime, today’s NYT says that Janet Evanovich made $16 million with her writing in the last year. I made $50. Sigh. At any rate, Plum fans will enjoy this one. It has the usual romantic entanglements – cop Joe Morelli is the love of her life, and extra-dangerous bounty hunter Ranger is the guy who tempts her from the straight and narrow. Grandma Mazur is still a hoot, Stiva’s is still the place to go for a good funeral, Lula is the chicken-eating ho with a zest for life and an itchy trigger finger. Rex the hamster munches apples when Steph’s feeling maternal. It may be a formula book, but it’s a formula Evanovich knows how to work to perfection. Downside? Stephanie’s been around the block a few too many times. There’s never a meaningful new character. Never any emotional engagement. The hilarious hi-jinks in the Burg aren’t memorable. I know that Sizzling Sixteen‘s plot revolves around the rescue of Stephanie’s cousin Vinny, who’s been kidnapped and held for ransom until the gang manages to pay off his $1.3 million debt. But that’s because I finished it today. Can I remember anything about the other 15 books? Nope. Do I care? Nope. That’s because the Stephanie Plum Series is the literary equivalent of a summer movie. It’s a fun way to spend a few hours. Drink lemonade. Laugh out loud. Evanovich has a deft approach to sexual tension, which is a plus. You don’t need to remember these books. That’s why there’s a number in the title. So that if you missed #12 (Twelve Sharp) you can get it from the library and head for the back porch. Recommended reading? Sure. Be sure to check out page 132, where Stephanie notices the “shears” hanging in the windows. If you envision, as I did, a gardening implement, you’ll get an extra laugh out of the book. Totally worth it. 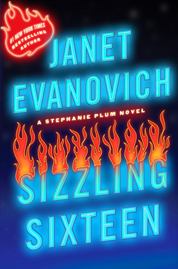 This entry was posted in Commentary, Review and tagged Janet Evanovich, Review, Sizzling Sixteen, Stephanie Plum. Bookmark the permalink. There was a time when Janet Evanovich didn’t make $50 with her writing. Just keep on writing, keep on editing and keep on making another $50…!